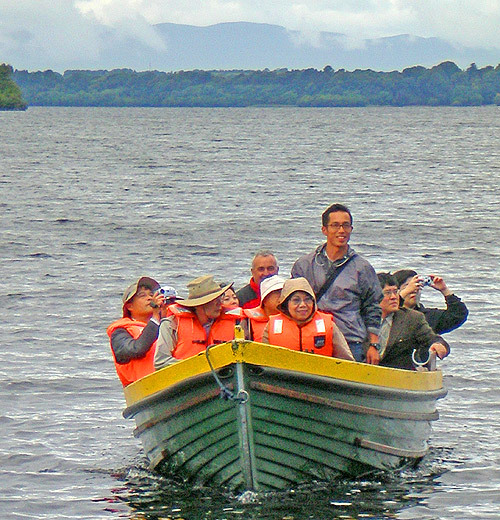 From guided trips around Killarney’s lakes to an amphibious craft on and off Valentia Island, the are numerous ways to enjoy Kerry’s famous lakes and coast. 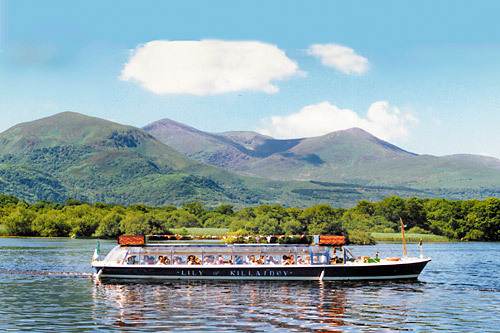 Two waterbuses operate from Ross Castle and they’ll bring you on a tour of Lough Léin, accompanied by a guided commentary on the history, folklore, flora and fauna of the Killarney lakes. If you prefer to travel by open boat you could take a short trip to Inisfallen Island, also from Ross Castle. Inisfallen has the remains of a medieval monastery and it’s also where one of the most important books on Irish history was written, The Annals of Inisfallen. 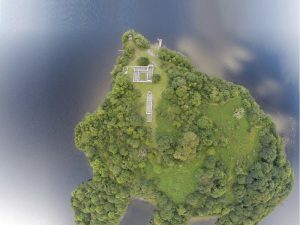 During the middle ages the island was a great centre of learning and among it’s students was said to be Brian Boru, High King of Ireland. 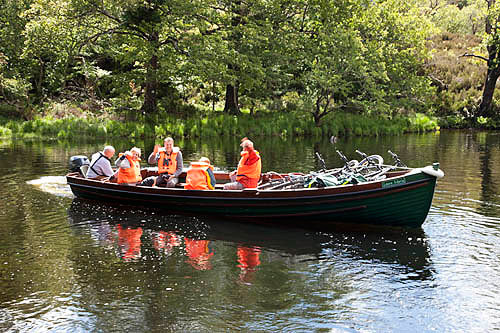 As mentioned on a previous show you can also cycle to Ross Castle and have yourself and your bike taken to Lord Brandon’s cottage on the Upper Lake. Beautiful journey that takes about an hour and costs about 15 euros. 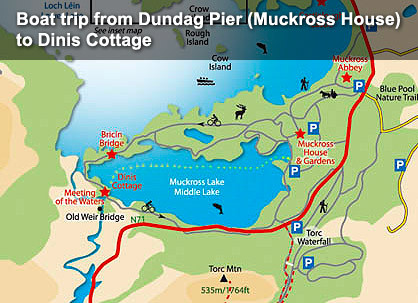 There are also trips to and from Dinis Cottage from Dundag Bay, just below Muckross House, for just €7 / €10 return. They will also take your bicyle at no extra cost. I think this week’s suggestion from Killarney is a real beauty. Last Saturday morning I was sitting at home doing some research for today when I decided it was too fine to be inside so I hopped on the bike and headed for Muckross. Fifteen minutes later I was standing on Dundag Pier, just below Muckross House, talking to John Lyne Snr. John and his son operate boat trips from Dundag Pier to Dinis Cottage, an old hunting lodge once owned by the Herbert family. They will also take your bicycle, if you have one. I was joined on the trip by 4 Dutch people. Once all the bicycles and ourselves were on board we headed off across Muckross Lake. It was a most beautiful morning. I was surprised by the questions of the Dutch visitors. They wanted to know about the rock types, the kinds of fish in the lake and about rhododendron. Fair play to John, he had all his information, including the fact that Muckross Lake is the deepest lake in Ireland and that if you dropped St Mary’s Cathedral into it only 5 ft of it would be above water level. He also pointed out where Queen Victoria broke a bottle of champagne off a rock and had it named after her (one place you definitely shouldn’t go paddling 🙂 ). I went for a cup of tea at Dinis Cottage. A very nice couple, Ali and Noelle, run a cafe there during the summer months and serve great home baking. For me, sitting in Dinis Cottage, sipping tea and looking out over the lake is one of life’s great pleasures. The peace and tranquility there is just marvellous. One of the things not to miss at Dinis Cottage are the engravings on the panes of glass on the window in the restaurant. In olden times is was common for the ladies to engrave their names on the glass using their diamond engagement rings. Ali tells me the oldest inscription dates to 1816. Back on the bike I headed for town via the Kenmare Road. On the way, a stoat crossed in front of me. I hadn’t seen one of those for a while. Stoats are like weasels except we don’t have weasels in Ireland. They are small and long with a brown back and pale underside, and have a long brown tail that has a black tip on it. As Jimmy Magee would say, “they box well above their weight”. I saw a stoat pounce on a rabbit one time in the McGillycuddy Reeks. Even though the rabbit did a double somersault about 3ft in the air, it failed to shake off the stoat. Back to the cycle trip; once you reach the main Killarney/Kenmare road you can take in Torc Waterfall, Muckross House and Muckross Abbey on your return journey to Killarney. Use your own bike or hire a bike in Killarney town. If you want to avoid much of the traffic you can hire a bike on the Muckross Road, just after the Gleneagle Hotel. Bike hire costs 15 euros a day and you’ll need some form of ID. The boat from Dundag to Dinis Cottage, with your bicyle, costs 7 euros for adults, 3 euros for children, one way. €10/€5 return. The Muckross/Dinis Peninsula is a one-way system. If you have small children on bicycles I feel it’s safer to cycle to Dinis Cottage and return by boat to Muckross House, rather than have them cycle down the Kenmare Road. I’m sure they’d enjoy the novelty of the boat trip. Another danger spot that requires great care is the traffic at Muckross Road/Woodlawn Road junction. The entire circuit from Killarney Town and back is about 14 miles / 22 kms and can take a half day or a full day, depending on the number of stops you make. Next, we’re going for a cruise in Kenmare Bay. As luck would have it, this is the best time of the year to do this trip because the Harbour Seal pups are about to be born. There are two operators that offer cruises in the bay, Star Outdoor who are based at Dauros, just outside Kenmare and Seafari who are based at the pier in Kenmare. 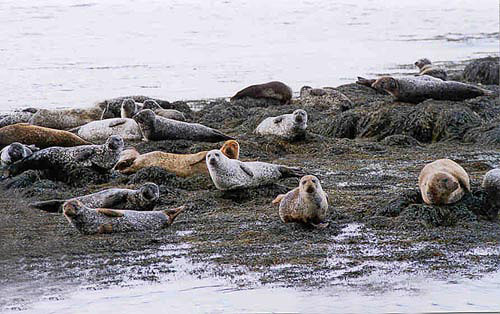 Kenmare Bay is really scenic with lots of islands, castles, manor houses, lots of seabirds such as gannets and cormorants but the main attraction is one of Ireland’s biggest Harbour Seal colonies. There are guides on board to tell you all the local history and about the marine life. Crayons and paper for the kids. Complimentary tea and coffee. No sea sickness guaranteed. These boats are all-weather. If it’s raining the trip is good also because the seals love a fresh water shower so they go on to the rocks whenever it’s raining. Both operators offer a professional, fun-filled and enjoyable tour. Seafari: The Pier, Kenmare: 2 hr /10 mile cruise. 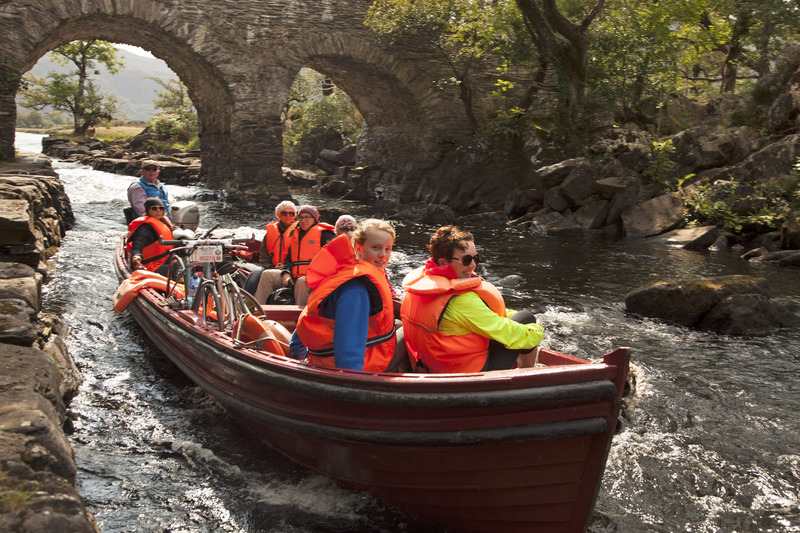 For 250 years, the Killarney Day Tour has been the most famous visitor excursion in Ireland. Mountains, lakes, woodland & legend in scenery that has no equal world wide. Travel by coach from Killarney town centre to Kate Kearney’s Cottage where you have the option of walking or taking a pony and trap through Ireland’s best know glaciated valley, the Gap of Dunloe. 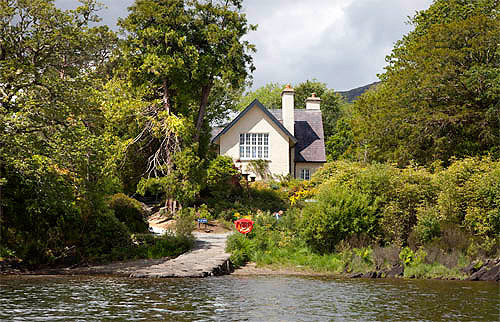 Upon arriving at Lord Brandon’s Cottage you will board an open boat for a cruise along Killarney’s lakes to Ross Castle. Whether you are a local or a visitor, this trip is a must. Tour operator, Dermot O’Donoghue, will take you and a bicycle from Ross Castle to Lord Brandons Cottage for just 15 euros. From here you can cycle the 8 miles through the Gap of Dunloe. The pony and trap through the Gap of Dunloe costs €20 per person and the bus to Kate Kearney’s, will pick you up at Ross Castle for €15. If you decide to walk the 8 miles through the Gap of Dunloe, which a share of people do, it will take you about 2 hours. Booking is essential. White tailed eagles, even though about 15 of them have died, mainly due to poisoning here in Kerry, there are still 55 survivors from the re-introduction programme. Foxgloves, in flower at present. The Latin name for the plant is Digitalis Purpurea. Extracts from the plant are used to strengthen the heart beat in patients with heart problems. In medieval times, if you wanted to get rid of your partner you gave them a foxglove sandwich and their heart took off like a Formula 1 engine and they keeled over and died. Visitors have been coming to Killarney for almost 200 years so the scenic areas (and most photogenic) are well known locally. These places have been linked along routes or tours over the years. Some routes are better than others – the Gap of Dunloe tour is a lesser known gem of Killarney and tour operator, Tadgh O’Connor, guarantees you a great experience! Bus and Boat Tour – Departing from O’Connor’s Pub, High Street at 10.30am. Inisfallen Abbey, located on Loch Léin in Killarney National Park, was founded in the 6th century by Saint Fionán. For a time the island was a leper colony but in the Middle Ages became an important centre of learning. The famous Annals of Inisfallen were written here between the 12th and 15th centuries. The monastery suffered many raids from Vikings and local clans. The buildings you see on the island today date mainly from the 12th and 13th centuries. Of particular interest is the Romanesque doorway of the little oratory. The island can be visited by boat with Gap of Dunloe Adventure Tours – operator Tadgh O’Connor. Cost €10/person (boat only). Departing from Reen Pier Ross Castle at 11am, 2pm and 3.30pm. Allow approximately 1 hour 30 minutes. Free Bus departs from O’Connors Pub at 10.30am daily (one way only). 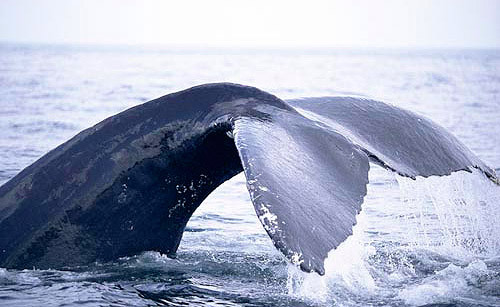 During the summer I got a text from Mick O’Connell, not the footballer but Mick of the Irish Whale and Dolphin Group telling me about two Humpback Whales that appeared off Clogher Head on the Dingle Peninsula. If you want a chance to see these magnificent creatures, you can contact Mick Sheeran in Ventry and Jan Duggan in Dunquin. Unfortunately for the tour operators, these whales are not as obliging as Fungie, the Dingle Dolphin, so there is no guarantee of seeing them. However, this area is rich in marine life so look out for Minke Whales, dolphins, seals and a marvelous variety of sea birds. Prices: €25 for 2.5 hour trip / €35 for 4 hour trip, children half price. Located at the Yacht Marina in Dingle, Co. Kerry, Dingle Bay Charters provides a wide range of boat trips for visitors to enjoy our beautiful coastline and islands. These include: Sea Angling, Dingle Harbour Tours, Blasket Island Eco tours, Blasket Island ferries, Fungie trips and Private Charters. 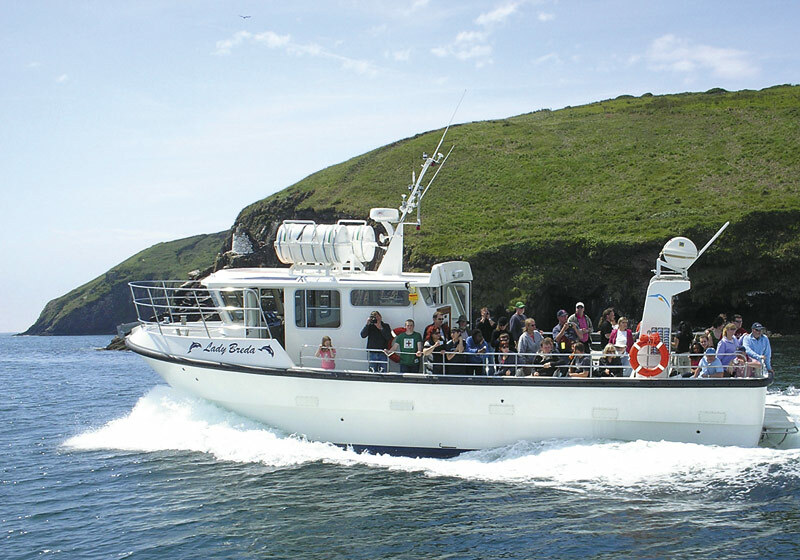 Harbour Cruise – Relish the delights of a short boat cruise of Dingle Bay with an enlightening commentary on local history and look out for Fungie the local celebrity dolphin. The Harbour Cruise is a guided tour, takes about 1 hour and it operates with 70 passenger covered boats. Cruises depart regularly from the Yacht Marina from April to September.